Too much of the rural scenes and legacies have given way to subdivisions and bulldozers. Many live in memories of longtime Oconee Residents. 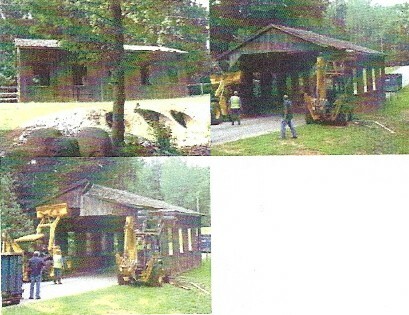 Maybe some money can be found to rebuild the Covered Bridge. 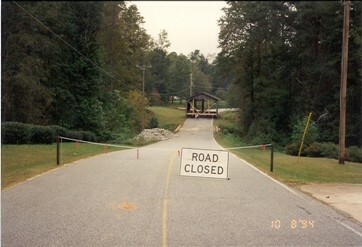 I only learned recently from a friend that the Northwest Woods Covered Bridge on Robinhood is GONE! Andrew Malcom, who lives across the road and saw his children grow up playing in the area was telling me about it. Andrew said one day last summer, (July 15, 2008) he was sitting in a chair at his house and heard a loud, crashing noise that continued for a few seconds. He went to investigate and saw a road contractor, digging up and repaving asphalt with a machine with a long fork on it. Then the damage was discovered. 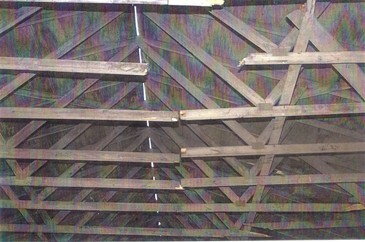 A number of roof trusses on the bridge were severed. Andrew was convinced that the contractor was responsible and tried to get county folks to pursue a liability claim. 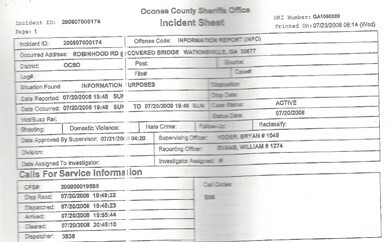 Andrew, a former insurance claims representative, thought the bridge was repairable. 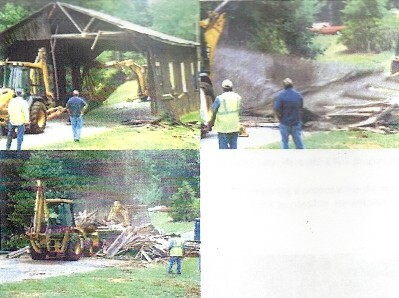 However, no one pushed it and a few days later the county folks demolished and hauled the bridge debris away. There was talk by the Chairman and Engineer about rebuilding but it seems the cost got lost in the budget shuffle this year. 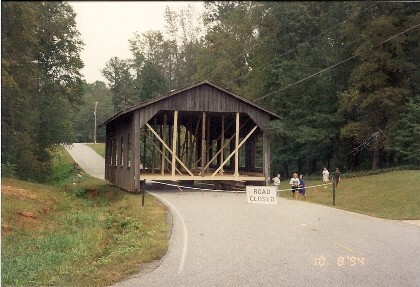 The Covered Bridge was built as an amenity for Northwest Woods, Sect V, by Developer Coleman Whitehead in the mid 1970’s. 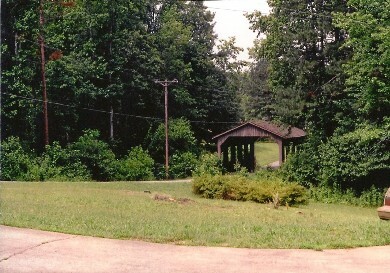 It has been a landmark for Norhwest Woods for decades. 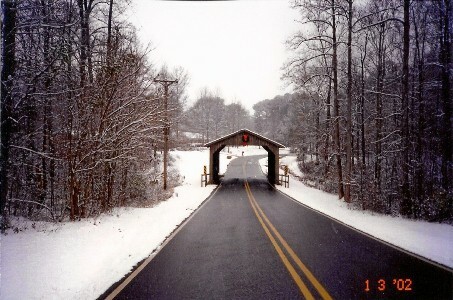 The bridge, with snow on it, looked like a Post Card scene in the Winter of 2002. 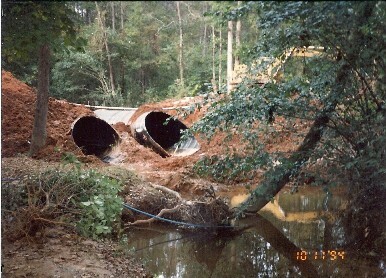 The culvert under the bridge failed in 1994, while I was Chair, and we moved the bridge temporarily, replaced the culverts, repaired and replaced the bridge. Many of our newer citizens may not miss the bridge. However, it does evoke memories and was important to many longtime residents. I immediately thought about the Old Well Shelter, from convict days, we saved in the early 90’s at the site of the New Jail. We moved it and set it up with a picnic table in front of the Frank Norris building. I wondered if it had once been at the old courthouse. However, the wrecking ball got it when the new jail construction was started a few years ago. It was good that the County finally moved and saved the Central School House at Heritage Park. We started on that project around the mid-eighties and had in mind saving more such structures to be located at Heritage Park, ie: country store, corn crib, mule barn, voting precinct buildings, typical homes of the past, Depression and Later era, etc.